Proverbs 2:2 "So that thou incline thine ear unto wisdom, and apply thine heart to understanding;"
Solomon wasn’t ignorant of his gift. He remembered vividly the encounter he had with God as a young king in Gibeon. It was there and then that God offered the son of David Divine assistance with his great task of leading the nation of Israel. Solomon asked for wisdom and God granted it. Solomon also remembered vividly what happened in Jerusalem shortly after that life-changing encounter. Two women came to him with a serious dilemma, one that had lifelong ramifications to both. These women were new mothers, both giving birth to a son at the same time. One child tragically died in the night leaving the young mothers fighting over the living child with each claiming him as her own. In an era void of technology necessary to prove the birth mother, the young king easily revealed the true birth mother with a simple statement, “Divide the living child in two, and give half to the one, and half to the other” (1 Kings 3:25). This extraordinary statement flushed out the uncontrollable emotions and unconditional love of the true mother. Solomon knew that he had been given wisdom from above. When Solomon suggested to his son that he receive his father’s words and hide them in his heart, he was doing so with the purest of motives. He wasn’t telling his son to listen to him merely out of honor or respect. He wasn’t telling his son to hide his commandments within him so as to be an obedient and compliant kid. Solomon’s instruction wasn’t motivated by a masculine appetite for respect. His suggestion wasn’t motivated by a paternal thirst for obedience. Verse two reveals the reason for verse one – Solomon wanted his son to listen to him so that Rehoboam could ultimately get the wisdom enclosed in his father’s words. He knew that God gave him wisdom. He knew that God could give his son that same wisdom through him. Solomon got his wisdom in a dream; Rehoboam could get his wisdom in a father. While children need to learn to give their fathers and mothers their undivided attention, parents need to teach their children a greater lesson. While children need to learn to listen to their parents without talking, parents need to teach their children a greater lesson. While children need to learn to respect the countenance and conversation of their parents, parents need to teach their children a greater lesson. While children need to learn to obey their parent’s commandments, parents need to teach their children a greater lesson. What is that greater lesson? It is the lesson that there is wisdom to be found in parental instruction. Children need to be taught the truth that a godly father’s word offers more than rebuke when doing wrong. A godly mother’s word offers more than praise when doing right. A godly parent’s word offers more than orders, commands, expectations and rules. There is wisdom in a godly parent’s word. It may not be sensed in the moment and it may not even be welcomed at the time, but there is wisdom in the words of a godly parent. Children of all ages easily make the mistake of assuming parental instruction and correction is given for the convenience of ‘Mom & Dad.’ Instead of seeing that instruction and correction is given for their long-term well-being, children see it given for their parent’s present well-being. 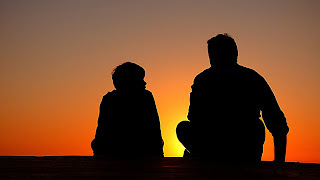 Children typically receive their parent’s words only within the context of making their parents happy – appeasing their parents, obeying their parents, complying with their parents – instead of receiving their parents’ words within the context of gleaning long-term wisdom so as to experience their own happiness as adults. How a child views parental instruction will determine how a child utilizes that instruction. If he views parental instruction as something only applicable to his childhood, then he will only benefit from it as a child. If he views parental instruction as something that is applicable to his life, then he will benefit from it for life. If a child or teenager views parental instruction as something that he must endure while he is in the home, then he will leave that home without wisdom. If a child or teenager views parental instruction as something that he can learn from, then he will leave that home with wisdom. Solomon wanted his son to hear his instruction with the intent of “inclining his ear unto wisdom.” He wanted his son to listen to him in order to become wise, not necessarily obedient. He wanted his son to listen to him in order to inherit his father’s wisdom, not necessarily his father’s fortune. He wanted his son to remember his father’s words in order to get his father’s wisdom, not necessarily his father’s approval. The phrase, “incline thine ear” is used throughout the Scriptures on a number of occasions. Throughout the psalms and the prophets in particular, holy men often asked God to “incline thine ear unto me.” It is a phrase that means, “lean your ear” or “lend your ear” or “listen up.” Solomon wasn’t as concerned with his son hearing his words as he was with his son hearing the WISDOM of his words. This father wanted his son’s ear inclined to long-term wisdom, not just short-term compliance. He desperately wanted Rehoboam to be listening for wisdom in his father’s words. It should be a parent’s top priority to get wisdom as Solomon got wisdom. It should then be a parent’s second priority to get that God-given wisdom to his or her child as Solomon was trying to get his wisdom to his son. If fathers and mothers made this their priority, then there would be a lot more conversation born out of imparting wisdom and a lot less conversation born out of inconvenience and impatience. Parents, if what we’re saying to our children has no wisdom in it, then we shouldn’t be saying it. If what we’re demanding or commanding offers no long-term wisdom for our children, then why are we demanding and commanding it in the first place? If what we’re saying possesses no wisdom, how will our children obtain any wisdom? If our children are listening for wisdom as Solomon instructed his son to do, are they finding any? Children can become wise from a variety of sources but there should be no more available source than that of a parent’s words.